Although I have a degree in Electrical Engineering, the economics at the time of my graduation lead me in the direction of software development. I did specialize in computer engineering, however my software engineering skills are largely self-taught. Over the past few years, I had been doing nothing with hardware at home (due to living conditions) and little at work (with the exception of device drivers). 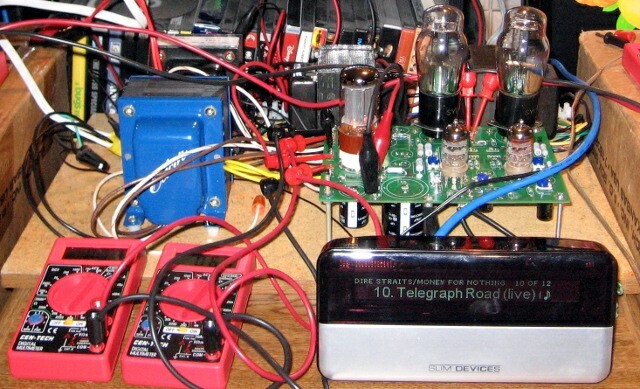 Since then, I have been trying to resurrect my electronics skills using various hobby-related projects, many of which have been sitting half-completed in boxes. George from Tubelab was kind enough to send me his latest PCB and some iron for a test build. Easy build and the result was tossed into a disused lock box. All of the cutting and milling and drilling is finally done. More about the build here. 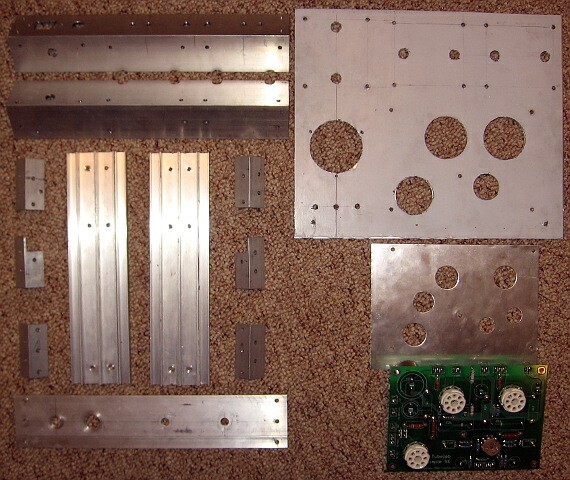 Next step is paint…. Voltages came in a bit high, even under load. 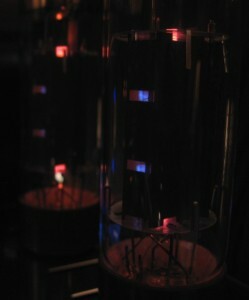 The top row is the Tubelab SE in “45 mode”, with about 25mA per tube. 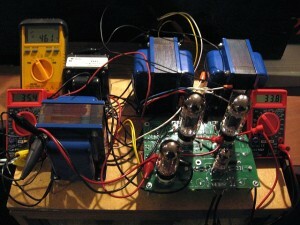 Meters are reading: 660VAC winding, 520VAC winding, B+ at the filter cap. Bottom row is in “300B mode”, running Shuguang 300Bs (not mine) at about 28mA per tube. First two meters got swapped: 520VAC winding, 660VAC winding, B+. 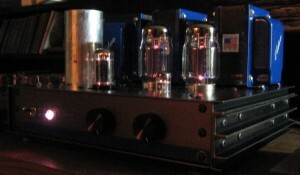 With the 300Bs biased to 80mA, the 660VAC winding gets pulled down exactly to spec: 660VAC. B+ sags to around 370-375 VDC. Supposedly this is the ideal spot for the 300B. 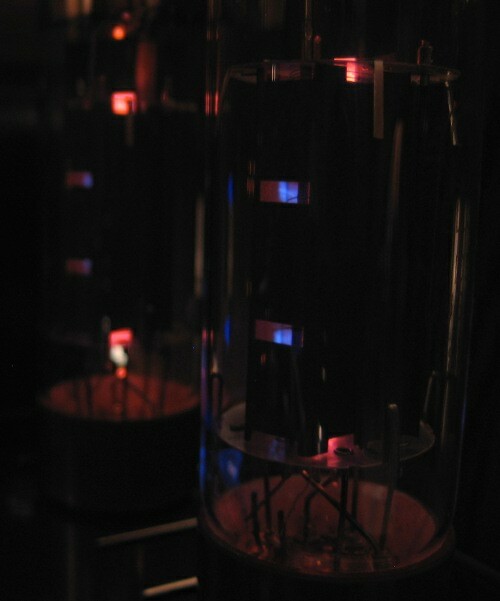 These tubes are Shuguang’s aptly-named “300BS”, which have mesh plates and globe-shaped glass. They have a weird blue glow on the glass, presumably from electrons flying through the gaps in the mesh. 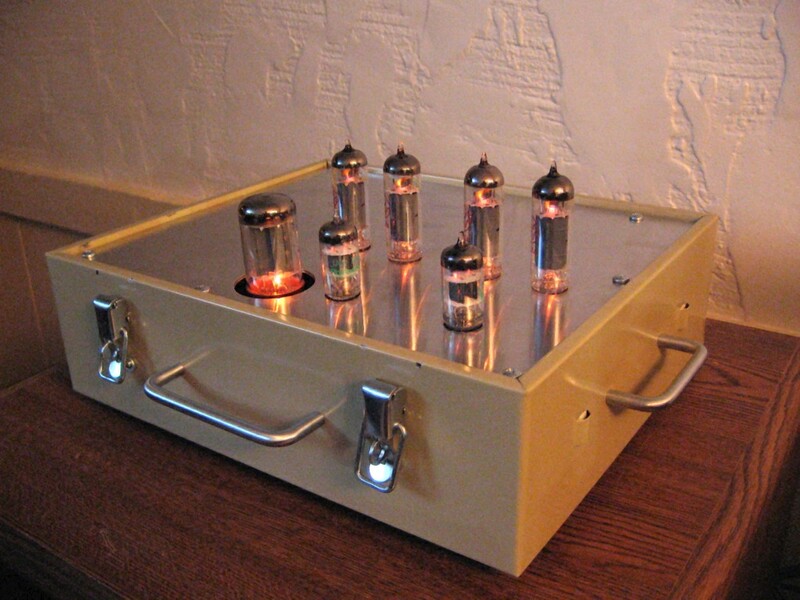 With the right iron, the Tubelab Simple SE comes to life. After a sanity-check with cheap Chinese tubes, here is the amp running with JJ 6L6GCs strapped as triodes. 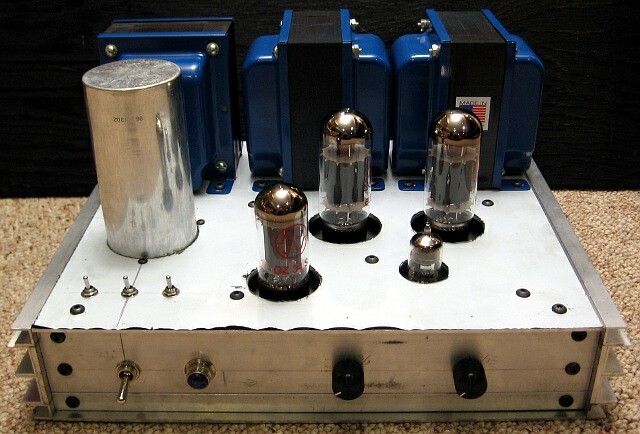 The amp sounds sweet with a bit more power than the Tubelab SE. 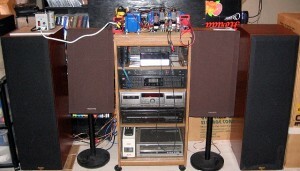 This coincides with the new speakers that I recently got off of Craigslist: a pair of Klipsch KLF-10s. 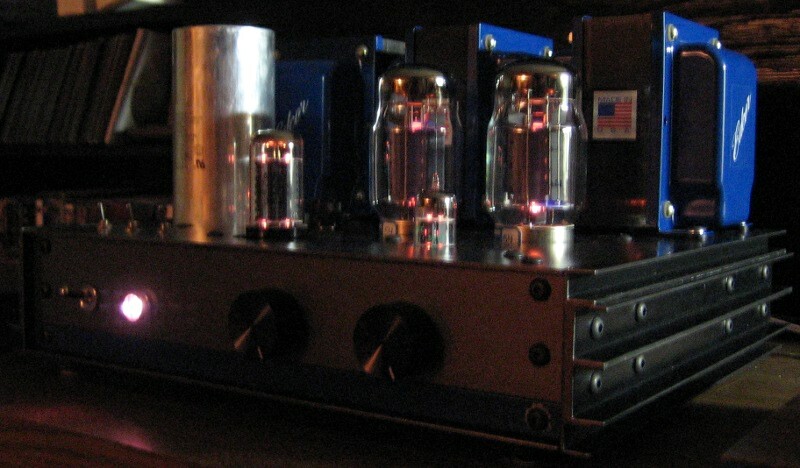 The horns on these do cause ear fatigue on the Dynaco, but with this amp it is more subdued. I am hoping that the DHTs in the Tubelab SE will be even better. The basement in currently under construction, so the setup is a bit MacGyver. 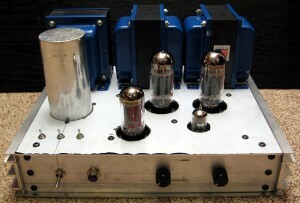 So I’ve finally built-up this Tubelab SE, a small, single-ended, 2 watt amp. It’s currently in breadboard form, but it sounds amazing. Awesome detail, impressive bass, and something warm about the sound. These are the output tubes on my Thomas amp. 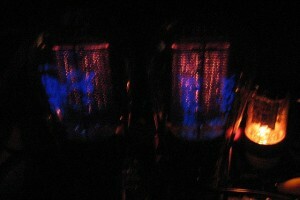 You can see the blue glow against the glass from stray electrons. 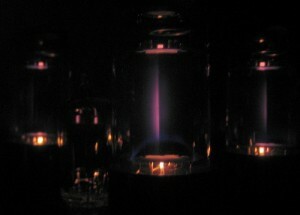 This is very common with Sylvania tubes. Behind the blue glow, is the red glowing line from the electron beam hitting the plates (I can’t get the bias to go any lower with this amp). The two together look purple to the camera. 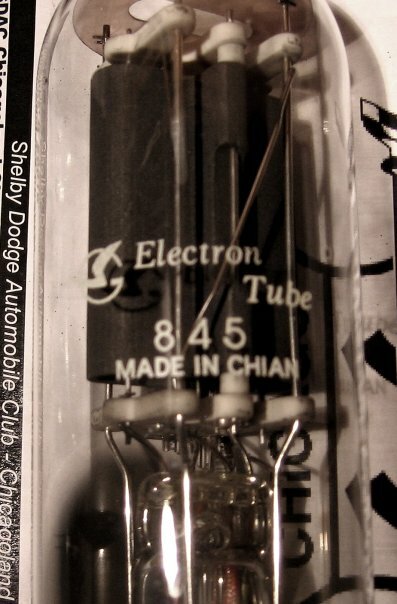 All the best stuff comes from Chian. 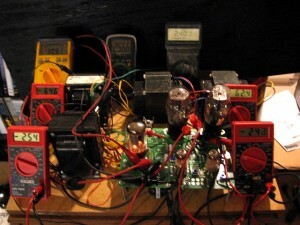 Disclaimer: Many of the projects described in these web pages use potentially dangerous voltages, materials, and components. The author assumes no liability for damages incurred through the use or misuse of the information provided herein. This information is provided "as is" and without warranties as to performance of or any other warranties whether expressed or implied. No warranty of fitness for a particular purpose is offered. Copyright Notice: All contents of these pages are Copyright ©1996-2015 by Russ W. Knize. All Rights Reserved. The information presented in this section may be used for personal, non-commercial use only. Any commercial applications of this design or any part thereof requires previous licensing arrangements with the author and copyright holder, Russ W. Knize.